When Grand Theft Auto III rocked the gaming world in 2001, gamers began to wonder what the open world gameplay of GTA would be like with friends. 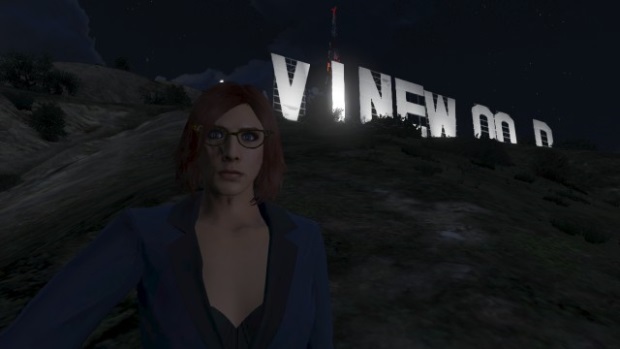 With the release of Grand Theft Auto V in September 2013, Rockstar laid the groundwork for just that: Grand Theft Auto Online. Does the game live up to people’s aspirations of what Grand Theft Auto would be like online? Or did we delude ourselves into thinking the formula would translate well to an MMO? A scenic view, before we realized our vehicle was left downtown. Character creation in GTA Online takes a wide swing away from your standard MMO or RPG: you actually choose your heritage based on what your character’s parents and grandparents look like. There are 14 different preset options for grandparents, which in turn generates how your parents look, and then your character. You can tweak that even more with sliders that allow you to more closely resemble mom or dad, too. The other unique facet of character creation is the Lifestyle selection. Here, you select how long your character spends sleeping, socializing with friends and family, playing sports and working out, doing either legal or illegal work (or both! ), sitting around on the couch, and partying. These selections determine your initial statistics of Stamina, Shooting, Strength, Stealth, Flying, Driving, and Lung Capacity. Outside of needing a minimum of four hours in the sleep category, how you add up the rest of the points is up to you – we opted for a balance of them all, with less emphasis on doing illegal work. As a result, our stealth and shooting stats were slightly low, but we had increased driving and flying skills. And now, the weather. 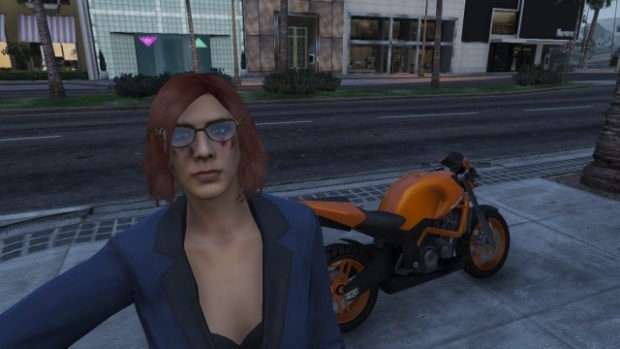 . .
Once you’ve created your character, you’re given a nice cut-scene that not only gives you some details on how online mode works, but is also different if you’re male or female. In fact, it’s worth seeing the female opening if only to watch Lamar (one of the supporting characters in the single player game) get completely shut down, despite his best attempts to woo your character. At this point, the game launches into tutorial mode. You’re put into a race against other new characters plus Lamar. The car you select here becomes your first personal vehicle. The goal of the race is to finish, but in true Grand Theft Auto fashion, you can be as devious as you want. Ram cars into oncoming traffic. Shoot out their tires with your newly acquired pistol. Race clean if you want; we managed to come in second place with this method. Lamar then sends you to hold up a convenience store with little more reason than, “Hey, you need money, right?” This not only teaches you how to hold up stores, but the basics of avoiding the police as well, if you manage to accrue a wanted level. Simply put, avoid the police conveniently marked on your radar until your wanted level fades. An added bonus to evading the cops is extra experience gain, so learn how, where, and when to hide out. The final tutorial mission sends you to retrieve a package from some drug dealers. We’re not saying the package is drugs, but it’s drugs: remember, this is the Grand Theft Auto universe. Once you’ve taken out the dealers and secured the package, you take it to the drop, and it’s mission complete. One last mission has you prove your combat skills in a team deathmatch style mission against others. Most players will only have a pistol at this point in the game. 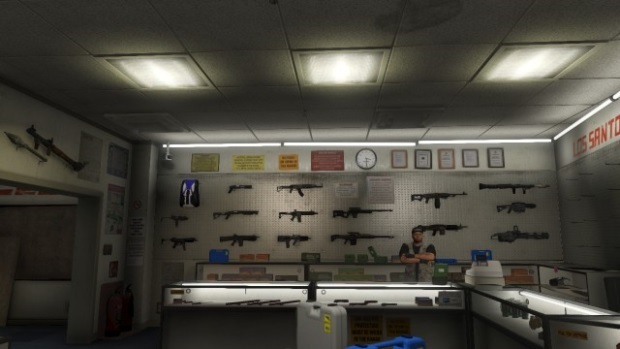 There is a convenient Ammu-nation (the game’s weapons and munitions store) right by the mission, though, and it pays to come equipped. We snagged a sawed-off shotgun, and headed in. Since the game offers an auto-aim feature, combat is less about skill, and more about taking proper cover and timing your attacks well. 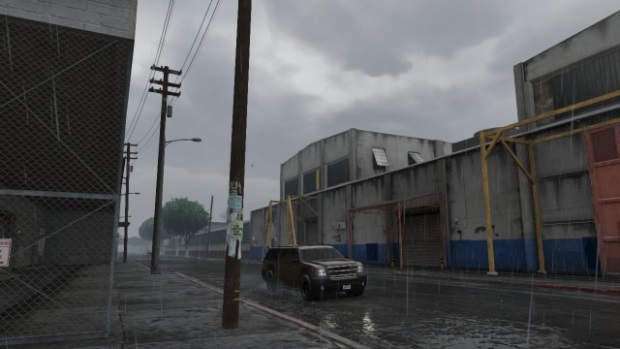 The urban battlefield also has a variety of health, armor, and weapon pickups on it, to help even the playing field, or completely topple it over into a biased advantage. Once you’ve shown your prowess (or lack thereof) in combat, the world is yours to explore. There are dozens of missions right from the start you can take: from races, to solo and team-based deathmatch arenas, to cooperative missions with various objectives, the world is yours to corrupt. You are also free to start wandering around in the world, picking fights with other players, or helping them with other open world objectives like lifting an armored car, or stealing a rare car to sell. From up here, you can’t hear the sirens. Well, unless you brought them with you. 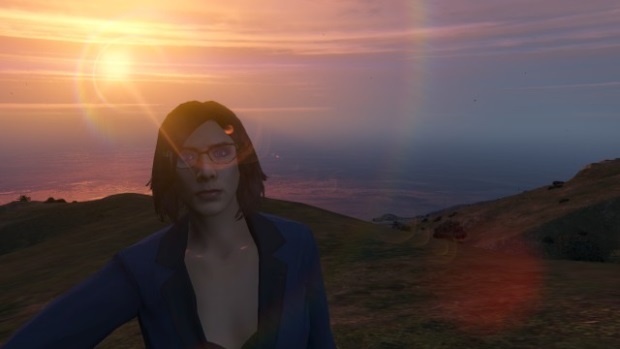 Each time you complete a mission in Grand Theft Auto Online, you earn money, and RP. RP is akin to experience points in other MMOs, and as you accumulate more, you gain in rank. Ranking up gives you access to more clothes for further customization, more weapons and equipment to help make your character more powerful, and more missions unlock to help you earn more money. Certain features of the game, such as flying and property purchasing can only be unlocked when you reach a certain rank. Money is obviously also very important. You need it to customize vehicles, purchase upgrades and weapons, and to buy properties. Property gives you a safe place to store one or more of your vehicles, in addition to being a safe zone. See, unless you toggle an option in the menu to turn yourself passive (which, by the way, also costs you money), players can kill you indiscriminately. Passive mode makes you immune to gunfire. Unfortunately, knowing this, people will instead decide to just run you over in their car. You are not immune to being a hood ornament. As mentioned, doing jobs increases your rank, and that higher ranks mean more jobs are available. The main problem in GTA Online is that certain jobs are more profitable than others, and many players therefore only stick to those jobs. While this makes gaining rank relatively easy, it’s quickly monotonous when you realize that with all the jobs out there, very few people are actually participating. You see, the world you’re in consists of a total of 16 players, but each of the missions can pull from the other servers. Once you’ve completed a mission, you’re dumped off on a random server which might be the one you were on, might be one with the other people you were on the mission with, or a different one altogether. Additionally, the game has a karma system to try and separate good players from the jerks. Finish a mission without leaving early, or without specifically trying to sabotage and you earn marks towards being a “good sport.” Conversely, destroying a person’s personal vehicle, leaving a mission early, and other assorted ill-spirited actions will push you towards being a “bad sport.” Drop low enough, and you will only be on servers with other “bad sports.” This does lead to a problem where people will intentionally grief others trying to grind out the missions for the sole purpose of being a jerk. Not much can come between a girl and her bike. However, plenty of things can run over them both. 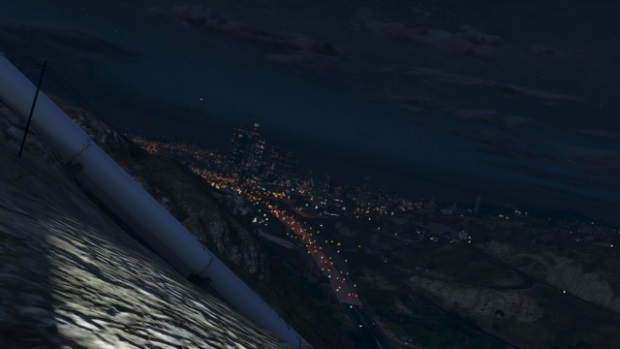 Grand Theft Auto Online has a lot of potential. Unfortunately, it’s just that: potential. One particularly nice feature of the game is how seamless it is to transfer from an online session into a single player game, but saying that’s a positive for an MMO is up for debate. So far, the players generally fall into one of two categories: either they just want all out bedlam in the open world, or are more concerned with running the same mission repeatedly because it maximizes money and RP gain. Thus, for most players, it’s putting up with the bad sports, or dealing with the tedium of grinding to get better. Not to mention the fact that there is nothing that says players have to cooperate in cooperative missions – and sometimes, they just don’t. Rockstar, for their part, has at least been trying to tackle player issues. They’ve dealt with connectivity and stability issues, rampant money cheats, and other assorted negativity surrounding the game. This hasn’t stopped people from finding ways around each and every change the company has implemented, however. 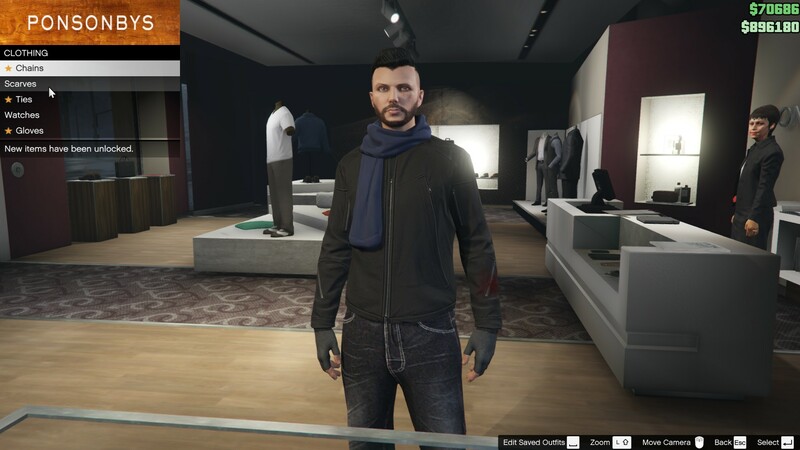 If you have a group of friends that play, or a great crew to help you out, it may be worthwhile to check out Grand Theft Auto Online, but overall, the game’s tediousness will likely having you hopping back offline for the sanctity of Grand Theft Auto V’s single player experience.